Biotinylated Human TRAIL R2, His Tag (TR2-H82E6) is expressed from human 293 cells (HEK293). It contains AA Ile 56 - Glu 182 (Accession # O14763-1). The protein has a calculated MW of 16.9 kDa. The protein migrates as 22 kDa and 24 kDa under reducing (R) condition (SDS-PAGE) due to glycosylation. 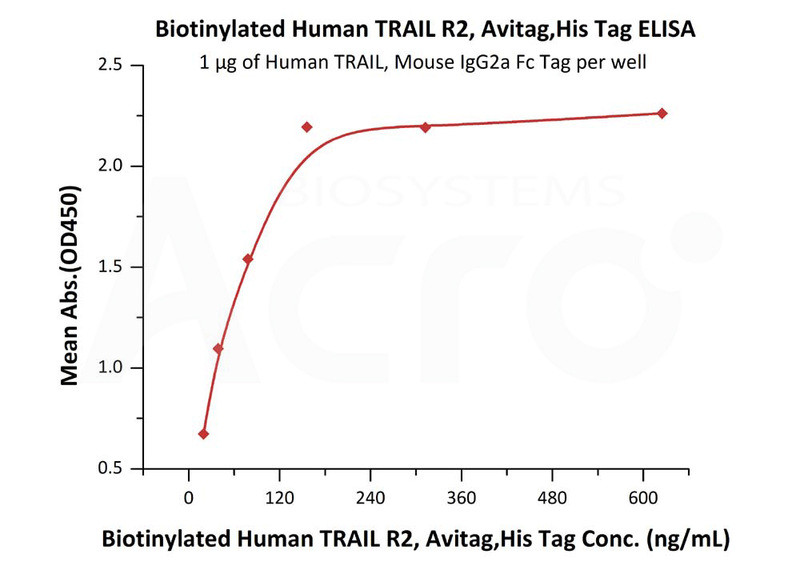 Biotinylated Human TRAIL R2, His Tag on SDS-PAGE under reducing (R) condition. The gel was stained overnight with Coomassie Blue. The purity of the protein is greater than 90%. 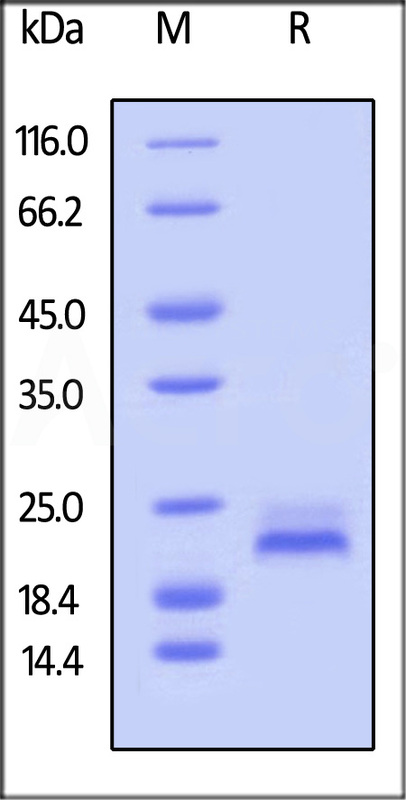 Immobilized Recombinant human TNFSF10 at 5 μg/mL (100 μL/well) can bind Biotinylated Human DR5, His Tag (Cat. No. TR2-H82E6) with a linear range of 2-156 ng/mL (QC tested). Tumor necrosis factor receptor superfamily member 10B (TNFRSF10B) is also known as TNF-related apoptosis-inducing ligand receptor 2 (TRAILR2), Death receptor 5 (DR5), CD262, KILLER, is a member of the TNF-receptor superfamily, and contains an intracellular death domain. TNFRSF10B / DR-5 is widely expressed in adult and fetal tissues; very highly expressed in tumor cell lines. TRAILR2 / CD262 / DR5 is the receptor for the cytotoxic ligand TNFSF10/TRAIL. The adapter molecule FADD (a death domain containing adaptor protein) of TRAIL-R2 / TNFRSF10B recruits caspase-8 to the activated receptor. The resulting death-inducing signaling complex (DISC) performs caspase-8 proteolytic activation which initiates the subsequent cascade of caspases (aspartate-specific cysteine proteases) mediating apoptosis. CD262 / DR5 Promotes the activation of NF-kappa-B. DR5 is essential for ER stress-induced apoptosis and is regulated by p53/TP53. (1) Yamaguchi H., et al., 2004, J. Biol. Chem. 279:45495-45502. (2) Gajate Consuelo, et al., 2005, J. Biol. Chem. (United States) 280 (12): 11641–7. (3) Chaudhary, P M., et al., 1997, Immunity (UNITED STATES) 7 (6): 821–30.